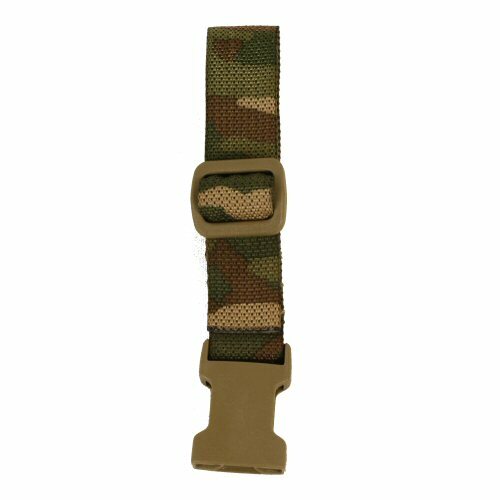 The British MTP 25mm sling point is a 25mm Cordura strap which is stiched down in three lines for an extra secure retention of the 25mm negative end buckle. The strap loops back onto itself and through a plastic ladderlock. The buckle end is matched to its counterpart located on the rifle, to make up a one point sling. 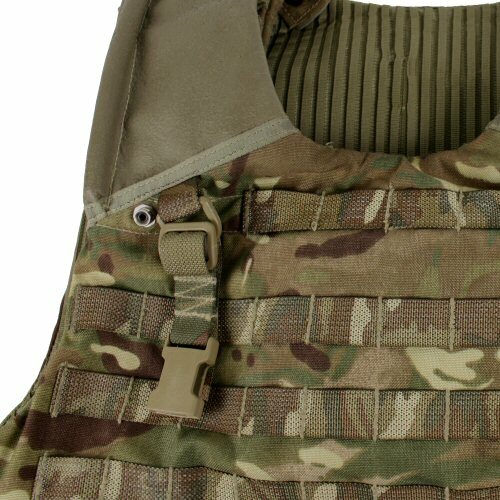 The sling point is often looped through the right side D-ring on the Osprey MTP Mk4 Armour Carrier, providing an instant point for attaching the rifle in an easy to use position. Made of Milspec IRR Cordura, printed with MTP. Shown attached on the right D-ring of an Osprey Mk4 armour carrier.